For the next week, EA and DICE are giving away free copies of Battlefield 1's Premium Pass for free on Xbox One, PS4 and PC, granting all Battlefield 1 players access to every map, mode and weapon that has been added to the game as part of Premium DLC packs. 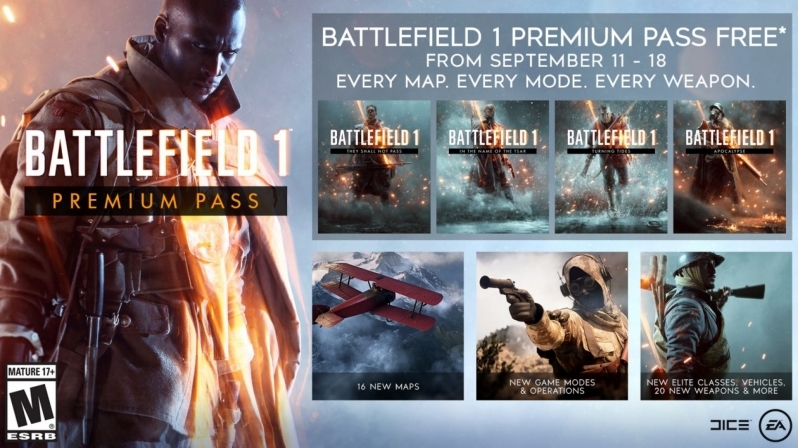 Battlefield 1's premium pass includes all of Battlefield 1's expansions, which includes They Shall Not Pass, In the Name of the Tsar, Turning Tides and Apocalypse, adding sixteen maps, new operations and elite classes to the game. New weapons and vehicles are also included with the game's premium pass. This limited time offer will allow owners of Battlefield 1's base game to access all of the title's post-launch content, which EA hopes will wet the community's appetite for Battlefield V, which will release this November. PlayStation and Xbox players require PlayStation Plus and Xbox Live Gold respectively to access this offer. You can join the discussion on Battlefield 1's Premium Pass becoming free for a limited time on the OC3D Forums. Cool. I had the option to buy the base game for around £5 or the complete package for £10 a few weeks ago. Being a single player focused gamer I opted to save the money; turns out I'll get all the DLC anyway. This is now live. Go grab it for free if you don't already have it.